Triple Gable Gothic is Halloween House No. 7 for the 13 Days of Halloween series. 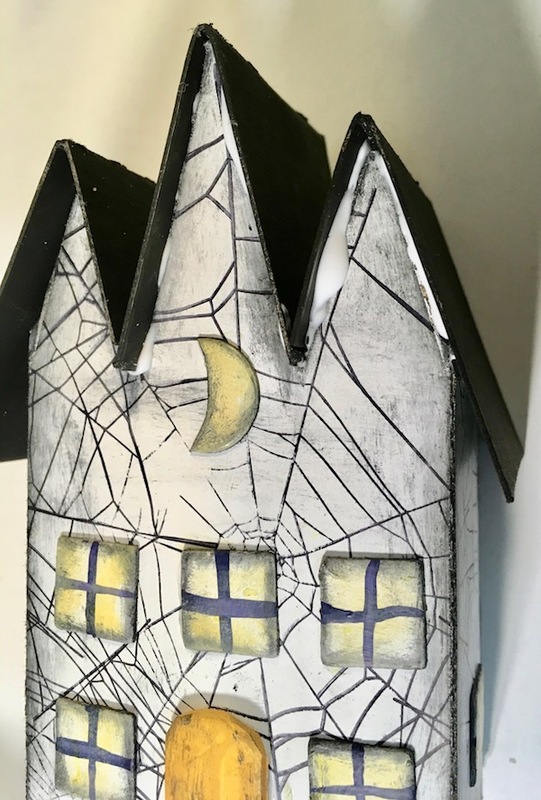 This house is unique with 3 steep gables for the roofline and stamped with spooky patterns for extra Halloween effect. 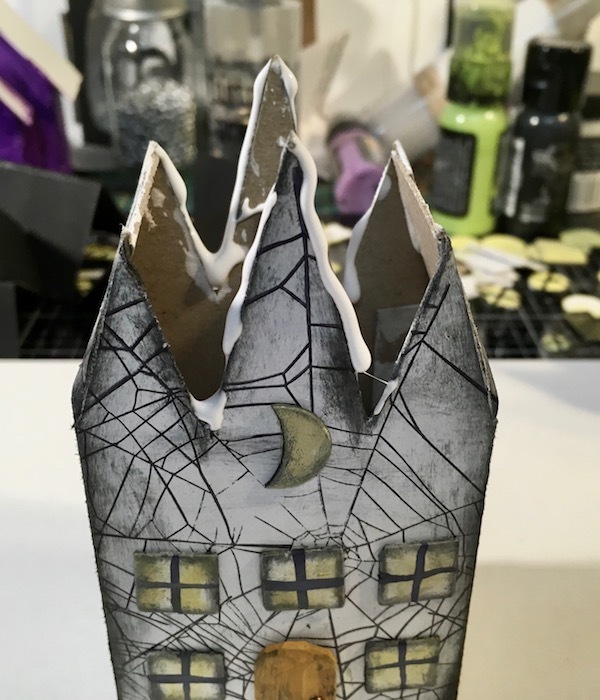 You can make this little Halloween house to add to your Halloween village with the free pattern from the Paper Glitter Glue library. 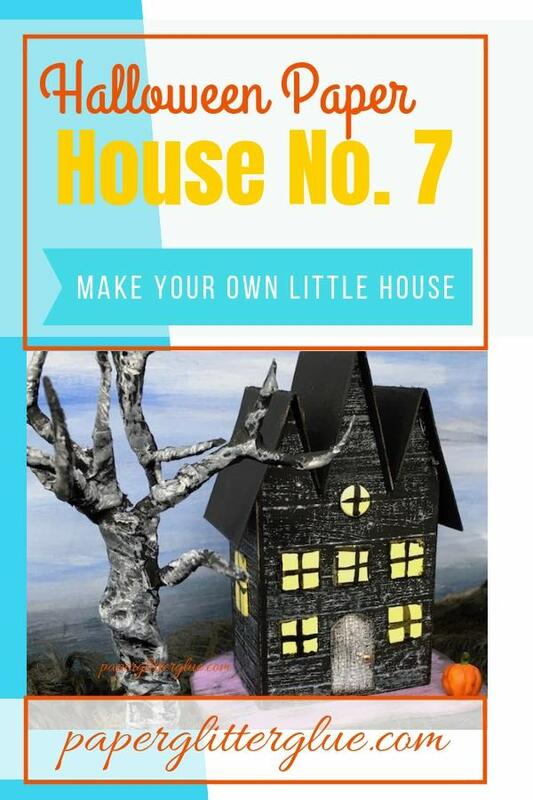 Let’s get started in this fun miniature Halloween house. WHAT DO YOU NEED TO MAKE The Triple Gable Gothic HOUSE? As always, you can find all my free patterns in my Paper Glitter Glue Library. I list the patterns chronologically. 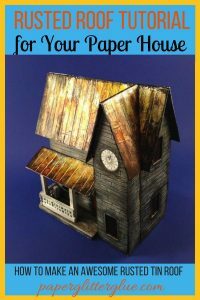 Which means you will find the newest 13 Days of Halloween paper house pattern first at the top of the library. 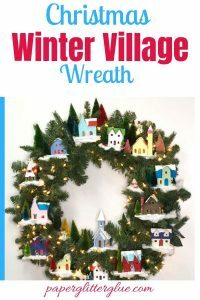 To get access to the library, simply subscribe to my newsletter with the form at the bottom of the post and you will be sent the password immediately so you can download the pattern. 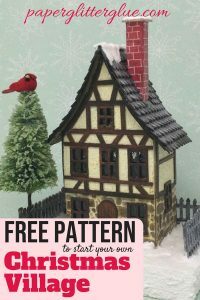 Then click on the library link, click to enter the password protected area, type in the password and then the list of free patterns and tutorials will be available. Paint – I use Tim Holtz Distress Paints because these paints work so well for Halloween projects. I also use either white or black gesso to prime my houses before I paint them. These directions are the same as the previous directions. The most challenging step in this house is gluing the roof on. So I have gone into more detail at that step. I have made an attempt at the SVG pattern for this house. Not sure if it works. I am out of town and can’t try it out to see if it actually works. Also as I’ve mentioned in the previous posts – I don’t yet know how to make compound paths to make the score lines. 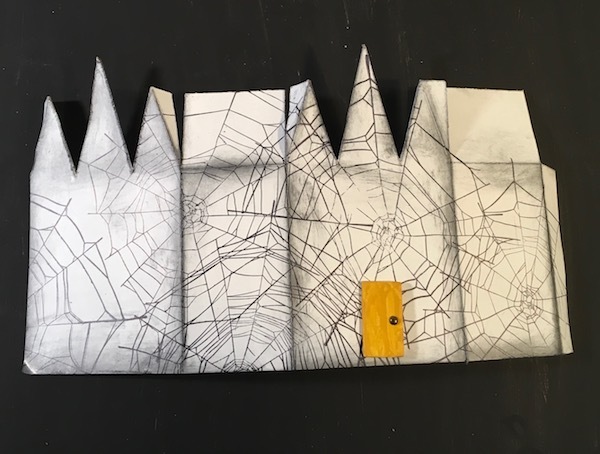 Use whatever method you want to copy the pattern to your cardboard. For these little houses, cut out a small piece cardboard a little bit larger than the house. They don’t need to be anything fancy. In fact, I think irregular works better for this little Halloween neighborhood. To mix things up on this pattern, I’ve painted one house black and one house white. Both are painted with gesso because it makes such a nice base. 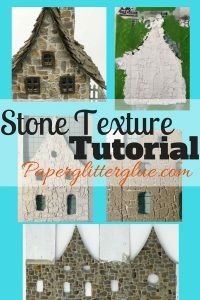 To add texture of the surface of the Triple Gable Gothic houses I used two different Stampers Anonymous stamps. One is called Planks and the other is Tangled Webs. They are perfect for decorating the surface very easily. Before you add the windows and doors, remember the front piece is the one WITHOUT the glue tab. The glue tab always goes in the back. Well, if you remember. Sometimes I decorate the wrong piece and the glue tab seam ends up in the front. Just paint the seam to keep it from showing up too much. So on the last house, I told you that I figured out the easiest way to make windows and doors for these houses because I am trying to keep these houses simple. Basically, just cut out little squares and rectangles for the windows and doors, then paint them. That way if you mess one up during painting you can just discard it. I prefer cardboard over paper because it gives a little dimension to the window or door. Also it helps to glue the windows and doors on the house before you glue it together. Now fold the house along the scored lines and glue the house together with the glue tab in the back. Let dry. Here we go. 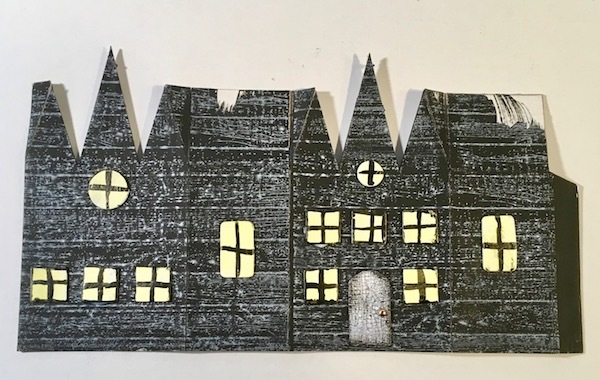 The only hard step on the Triple Gable Gothic Halloween house is gluing the 3 pieces of the roof onto the gables. I tried making the roof with just one piece, but it didn’t work. I found the cardboard folds were too thick and wouldn’t fit down in the sharp angles of the gables so I went with 3 different pieces. You’ll see several photos to help you with this step. First glue the middle gable piece in place. Apply a thick bead of glue to the middle tallest gable. Then apply the folded middle roof in place. Try to center it over the gables so that there is an equal overhang on the front and back. The tip of the middle gable is skinny and pretty flexible. Sometimes I have to push it in place with a pencil or stylus. Hold the roof piece in place until it sticks pretty well. Mop up the excess glue that oozes out. Hold in place to let it dry. This is critical because the next 2 sections are dependent upon this one being secured. After the first middle piece has been glued on, glue on the next 2 roof pieces. Again try to center them on the roof with equal distance of overhang on the front and back. It doesn’t always work. Mine are often uneven, but I think I notice it more than anyone else. 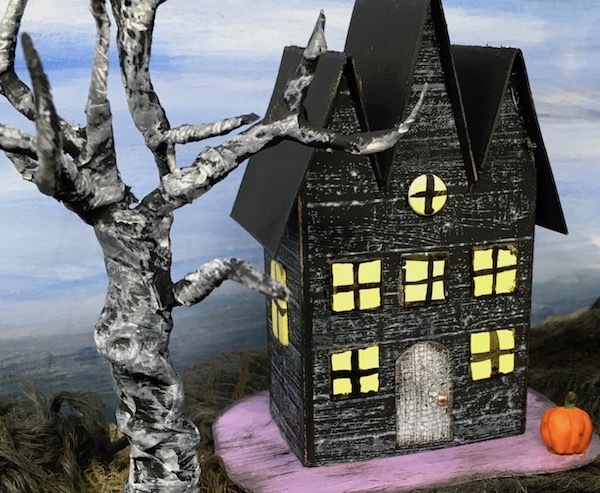 Now that you have the roof in place, your little Halloween house is basically done. Pick a contrasting color for the base and paint it. Distress the base with paint it if you like. That’s one of my favorite details. To glue the house to the base, apply a thick bead of glue onto the bottom of the house and apply to the cardboard base. Let dry. Finally we come to decorating part of making the little house. Just like the other houses, I am keeping in simple with the same little polymer pumpkins. And once again, I suggest you use more imagination than I have. 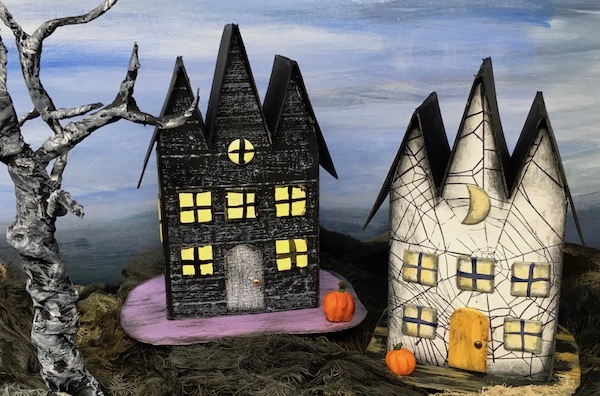 Go wild with your little Triple Gable Gothic Halloween House. This is one of my favorite designs. Tomorrow’s house is a variation on the Triple Gable Gothic. 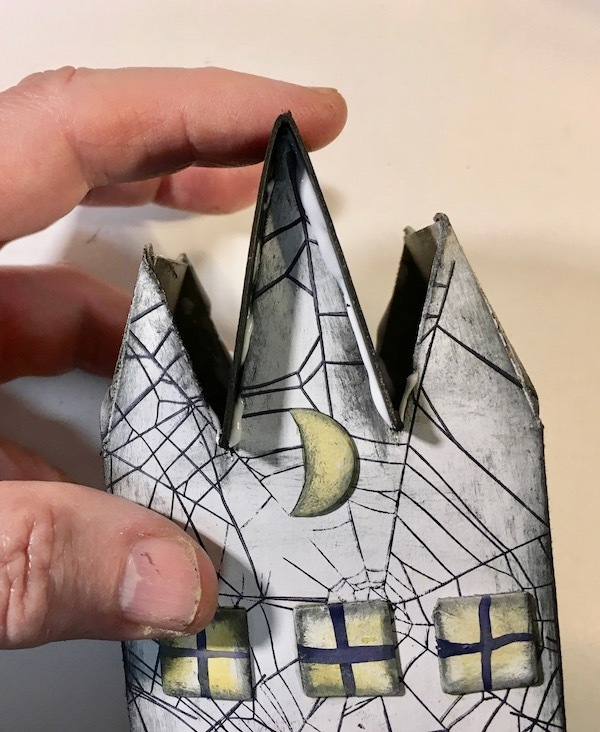 It’s a miniature Bat Wing House. I think it looks really cute, too – I mean spooky. If my directions aren’t clear, please let me know. Leave a comment or email me at Lucy@paperglitterglue.com and I will be glad to help. See you tomorrow with the Miniature Bat Wing House. P.S. 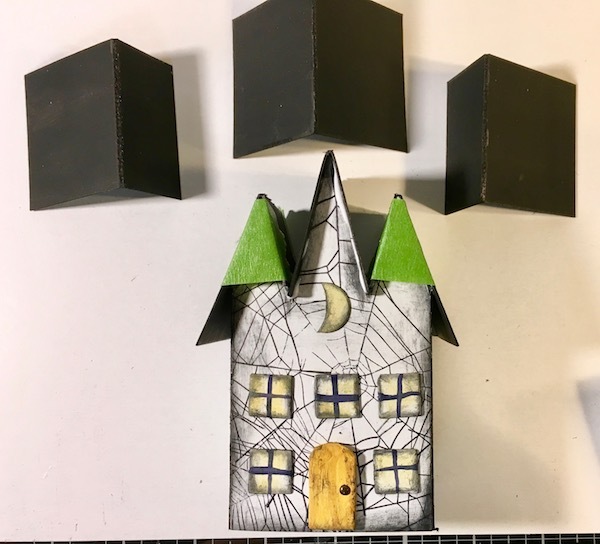 I am adding this house to this week’s Simon Says Stamp challenge called Halloween/Spooky. They always have inspiring projects on that challenge. Check it out. 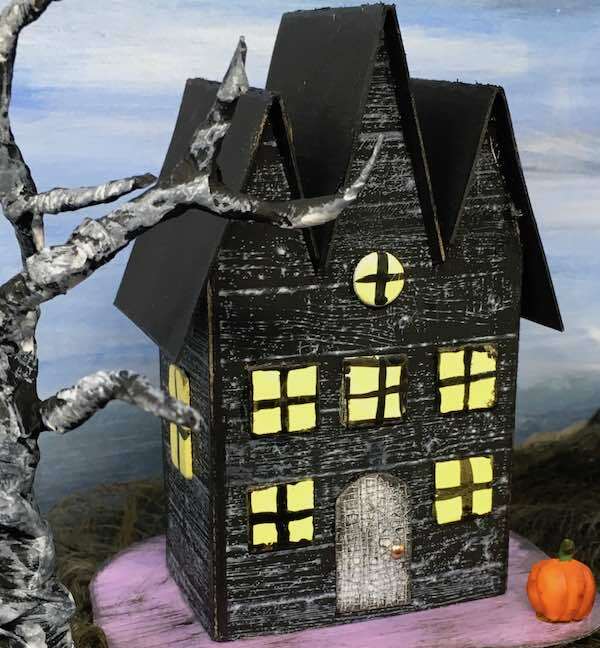 This little Halloween house is the 7th in the 13 Days of Halloween series. It’s called the Triple Gable Gothic house because of the 3 steep gables on the roof.